No tractors and no insecticides means managing a staff of horses and turkeys. Sometimes innovation means going a little retro. 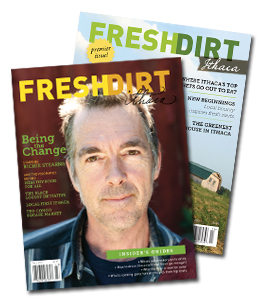 NEW BEGINNINGS: A collection of profiles published in the Fall 2011 issue of Fresh Dirt Ithaca. An ethnomusicologist turned breadmaker. A healer who also makes natural beauty products. A woman who returned to her family’s dairy farm to start making artisanal cheeses. And a young couple who decided to create a permaculture farm. What is it about this region that inspires people to find new beginnings? If you passed by these 69 acres of land a few years ago, you would have seen a corn, soy, and wheat farm, split into seven fields and extending down to Route 89. Now, overlooking the lake is a brown barn with a red roof surrounded by movable high tunnels that look like greenhouses. You won’t see John Deere tractors, nor will you see perfectly subdivided crops. Instead, you’ll see chickens dodging around Asian pear trees while garlic peeks through asparagus and horses peacefully mow the fields by grazing. This is the picture of a permaculture farm, one that supports co-owners Melissa Madden and Garrett Miller’s mission: using multiple crops and animals within the same space to create a natural habitat that will produce a variety of food for a very long time. While conventional farming devotes large sections of land to single, annual crops, permaculture farming is designed to closely imitate a natural ecosystem. It’s more complex to get started because there are more elements in the mix and the return tends to be lower at first. Once it’s up and running, though, it requires less work, because each element provides some kind of service for the others. Before they’re sold for Thanksgiving dinner, the turkeys lay down the fertilizer where winter salad greens will be planted in the high tunnels; the 250-plus apple trees (planted courtesy of the Ithaca Crop Mob) shade the asparagus; the 24 acres of woodland provide firewood, fenceposts, and, eventually, shadeland gardening. So they bought the acreage in Lodi, then brought on two horses, Betsy and Randy, adopted from an Amish farm, to mow and plow. Miller built the barn and high tunnels. 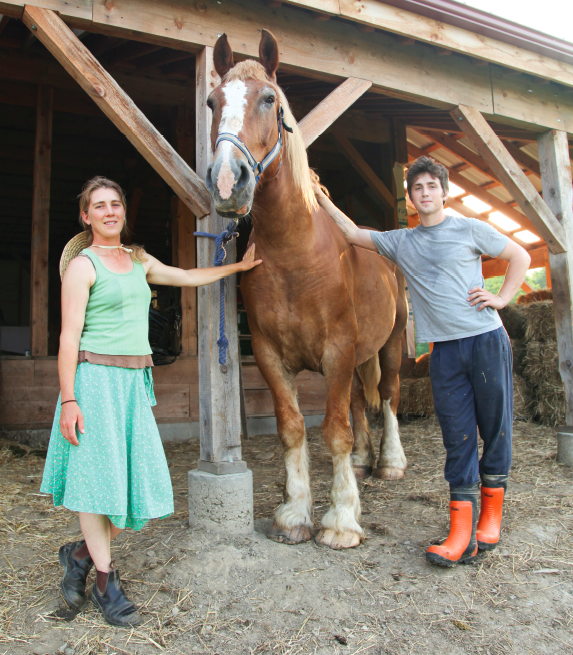 Miller and Madden eventually want the Good Life Farm to be self-sustaining, using no gas or oil and instead getting energy from photovoltaics and horse power (literally). In the meantime, they’re finding ways to meet the community’s needs. Last year there was a waitlist to buy their turkeys; this year they’re introducing broiler chickens; next year they hope to do an organic fruit or poultry CSA.